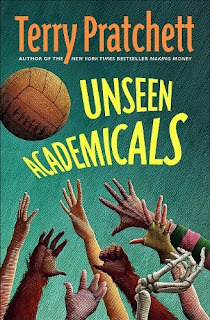 HarperCollins has been generous enough to offer THREE copies of Unseen Academicals, by Terry Pratchett to BookLust readers (well, to those located in the USA and Canada)! The wizards at Ankh-Morpork's Unseen University are renowned for many things—wisdom, magic, and their love of teatime—but athletics is most assuredly not on the list. And so when Lord Ventinari, the city's benevolent tyrant, strongly suggests to Archchancellor Mustrum Ridcully that the university revive an erstwhile tradition and once again put forth a football team composed of faculty, students, and staff, the wizards of UU find themselves in a quandary. To begin with, they have to figure out just what it is that makes this sport—soccer with a bit of rugby thrown in—so popular with Ankh-Morporkians of all ages and social strata. Then they have to learn how to play it. Oh, and on top of that, they must win a football match without using magic. Meanwhile, Trev (a handsome street urchin and a right good kicker) falls hard for kitchen maid Juliet (beautiful, dim, and perhaps the greatest fashion model there ever was), and Juliet's best pal, UU night cook Glenda (homely, sensible, and a baker of jolly good pies) befriends the mysterious Mr. Nutt (about whom no one knows very much, including Mr. Nutt, which is worrisome . . .). As the big match approaches, these four lives are entangled and changed forever. Because the thing about football—the most important thing about football­—is that it is never just about football. If you would like a chance to win a copy, just leave a comment by noon (CST) October 12 with your e-mail address and either your favorite satirical or your favorite fantasy novel. I will choose three winners at random that evening and contact you via e-mail. You get an extra entry if you are a BookLust subscriber or follower (just let me know in your comment that you are). NOTE: Your entry WILL NOT be counted if you do not include all the elements above in your comment. Please remember your e-mail address AND your favorite book. I don't know if I've ever ready a fantasy novel...does Harry Potter, and Twilight count? I have all of Terry Pratchett's books, he is my favorite author! I sure hope I can win this one! Favorite satirical novel...I'll go with "Moo" by Jane Smiley. Thanks for the giveaway! Choosing a favorite fantasy novel is difficult... it's between either Monstrous Regiment by Pratchett or The Hero and the Crown by Robin McKinley. OMG!!!! As a devout Pratchett fan I just have to have this one !! Please please please enter me too !!! I have too many fantasy favorites. I like Neil Gaiman's books and also Terry Brooks' Shannara novels. My teen daughters are the ones who got me hooked on the Twilight series and the House of Night series and all the other vampires stuff. We love them all! I am now following your blog and I'm adding you to my blogroll so I remember to come back. You have a great blog! Hitchhikers Guide to the Galaxy! I would love a chance to win this! my fave fantasy novel? would be the entire series of The War of The Spider Queen (Forgotten Realms) :) it's an awesome read. Favorite fantasy novel/series/guilty pleasure: Kushiel's Dart, by Jacqueline Carey. Yes, its ridiculous and frothy and in love with itself, but I can't help but adore it. Favorite Satire: Terry Pratchett's "Mort." No need to enter me. I'm dropping in to say it's great to meet you and thanks for the e-mail. I've got this posted at Win a Book. Yay for a Pratchett book. I'm all excited. You cannot go wrong with The Hitchhikers Guide to the Galaxy. I'd love a chance to win. I have never read anything by this author, but I have been meaning to. My favorite fantasy novel is actually a set called The Empire Trilogy. If you're interested in reading them, the first is called Mistress of the Empire, and it's very good. first of all: Hooray for Helena Justina! I adore her and all her family, both related by blood and affection. Favorite fantasy? The one that impressed me most recently was 'Darkborn' by Alison Sinclair. Stunningly good read. Terry Pratchett is my favorite humorous fantasy author. I'm so happy to see he has another book out! My favorite fantasy novel... that would be Watership Down. Humorous/satirical fantasy... I'd find it difficult to choose between Small Gods, The Truth and Feet of Clay. Please enter me into the giveaway as well! My favourite fantasy novel (apart from everything Sir Pratchett's ever written) is American Gods, if that counts. If not, then Coraline. I think for favorite satire, it's a tie between "Small Gods" by Pratchett and "Wicked" by Gregory Maguire. My email is blackrose@darkk.net. Thanks for the chance to win. My favorite fantasies at the moment are Mistborn by Brandon Sanderson, Graceling by Kristin Kashore (?) - I have not read anything by Pratchett yet. That's easy - my favorite is Mort by Pratchett. I absolutely love that book. And I'm thrilled at the chance to win his latest novel. I'm a big fan. Ooops! I forgot to include that I am a follower. Please enter me. Thanks for the chance. My favorite fantasy novel is Percy Jackson and the Lightening Thief. My favorite fantasy by Pratchett is Hogfather. Another favorite is A Dirty Job by Christopher Moore. This is my first time to try for a free book. My favorite fantasy novels are the Harry Potter books!